Roll call time, who's in? I'm making the trip up from Houston. Only my second time coming to MSRC, and my first time on the big track. I've been a little surprised at the apparent lack of any solid notes for the 3.1, though I think I'm picking up some good starting points from assorted run videos. I'm taking a much more disciplined approach to learning the track this time - when I came up for the 1.7 last year, I read some notes and watched some videos, called it done, and in the end wasn't too happy with how things shook out. This time I'm taking about half an hour or so every day to watch run videos and really get the knowledge internalized. After about five days I can decently visualize the track, though I'm still working on starter reference points. I think I'll be in a pretty solid place by next Saturday. Ton of really good information in the linked thread. The quality of the audio and video in this is not great, but it helped me before my first DE at MSRC 3.1. Arghh, can’t do it - was supposed to be overseas, trip cancelled but TDE booking was full already. Good stuff, this nicely fills in some of the gaps. I've gotten a decent idea of what the line around the track looks like, so adding in some notes about how the brake/throttle/etc inputs figure in is another leg up. I figure it's a good sign of my learning so far that I could visualize every part of those notes without referring to a video or anything. Yup, this was the first thing I found that's kind of been the foundation of my learning. Like you said, quality isn't great, but it's a decent primer. Yes but watching son (20) in the car. He’s been on 1.7 and 1.3. Have you guys received your email from TDE / Rick S. with car #'s, etc. for next weekend? We have not - normally we would have by now. Yeah, I got that email from Rick on the 6th, so over a week ago. I saw this in the other thread too, but I'm not seeing the notes...are they supposed to be in annotations or the video description or something? All I'm seeing is just the in-car video. Yeah... they were annotations. I think YouTube changed that and removed them at some point in the last year. Alas. Well, it's still a solid lap to watch. I'm in. I'll be headed up from Sugar Land Friday morning I hope. Need to get a trailer rented licktey split. Actually what I need to do is buy a trailer, but time to shop for one is hard to come by these days - totally a first world problem. I reserved a Uhaul trailer a few days ago. According to them, there's "high demand in the area" and so I won't know until about 2 days before whether they actually have a trailer for me. So today I compiled some alternatives that I can work on if need be. Worst case, the car is street legal and capable of the drive, it's just not my preferred option for a longer trip like this. You may also choose to read this message as "have truck, will tow," if it suits you. Thanks for the offer BTW Cliff!! Maybe just different locations? I picked the nearest one to me, in I-10 in Katy. The email I got implied that it was possible I might have to go to a different location (maybe that location will be Sugar Land). I'm pretty sure I'm fine, I just have a slight obsession with creating backup plans. You can have my uhaul reservation now. Found a good deal on "yon listeth of Craigery". 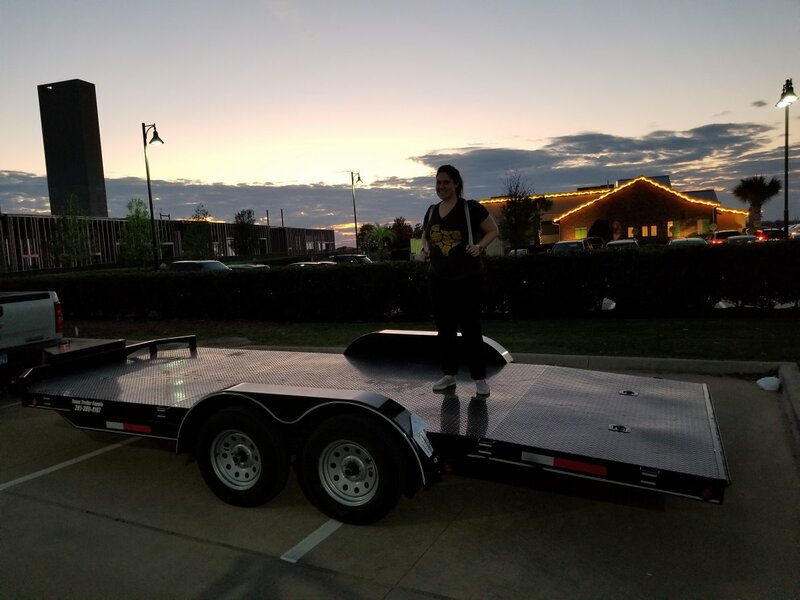 The wife modeling the trailer while I hold the baby - what a team! Fun day. By the end of the day I was pretty comfortable and putting down reasonably consistent, if not especially blazing times. The forecast rain held off almost entirely, other than a period of light drizzle around midmorning. I got paired with Lee Cash as my instructor, and he's never not fun to have in the car. He was my instructor my first-ever weekend and also did my yellow checkride. Oh and I got to see @joesurf79. Thought he was going to be my afternoon instructor ride but apparently he'd swapped cars with someone for that session. So I pretezeled into a Fiesta ST instead. Torque, shmorque...I get a decent helping of that in my car. Hands down the funnest instructor ride I ever did was in a prepped Miata at TWS. It's fun to experience the momentum-car life. Speaking of momentum cars...I had a fun moment Sunday morning. Guy in another prepped Miata caught up to me into rattlesnake and stayed right on my rear bumper through T5. I guess maybe he wanted to keep momentum down the hill to make sure I wasn't going to Viper away from him and not give the point after T7, but he didn't seem to be prepared for me to get on the brakes for turn-in and ended up locking all four and going off. Not sure if he was expecting me to wait until Miata o'clock to brake or what. Admittedly my brake point there can probably be pushed a bit further, but I don't feel like I was throwing the boat anchor out super early or anything. Got a couple of good shots this weekend. I also discovered that Miatas can't fly . . . dang it! Second video... ooof, that looked painful.